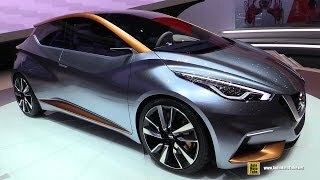 Saying the new Nissan Sway Concept 2015 as the most exciting hatchback till date won’t be wrong at any point but question arises how far it’ll reach the ideas once done with production? The Japanese company looks all prepared to hit the conservative European market with its new Hatchback concept, but looking at the produced successful crossovers by company the concept definitely seems to be far futuristic. Still the concept is worth a glance and being precise is commendable, let us have a look at it from various angles. 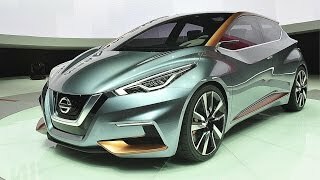 The first thing to notice soon after entering the model through its bold-contoured doors of Nissan Sway Concept 2015 is its, gliding wing shaped white and blue dashboard. The dashboard is mounted with a three aluminum spoke steering wheel, which we personally believe that might lose its conceptual essence if the model isn’t a high performance one. Through the steering wheel view allows the driver to an instrument cluster with two gauges, as for the rest of information Nissan brings a well sized trapezoidal tablet above the center stack. The screen allows both, the driver and the front passenger to view stats and use rest of its features. The lightweight seats showcase aluminum structures, while the upholstery brings pseudo like fabric with brilliant stitching. The interior of the Sway Concept comes with deep blue contrasting with ivory and orange colors. The color contrasts portrayed and the design in all makes a brilliant interior. 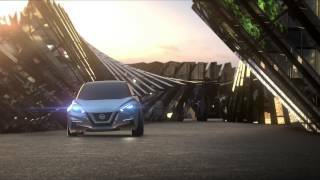 The company seems to have applied the radical thinking of two recent success stories of Qashqai and Juke in the exterior of Nissan Sway Concept 2015. The beautifully planted grille, huge intakes and the LED headlights together create the impeccably attractive front fascia of Sway Concept 2015. 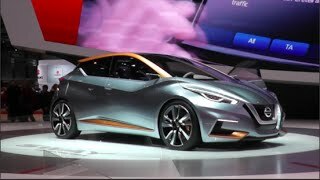 Taking a step ahead of the traditional hatchbacks in market the Nissan people have come up with big Panoramic floating glass roof finished in orange while the contours are making remarkable presence beginning from hood till the rear fenders and side skirts. The exterior color of the Sway Concept is bluish dawn grey with the minute hints of blue well visible beneath the lights, with perfect blend of orange marking attractive ambience all the way. 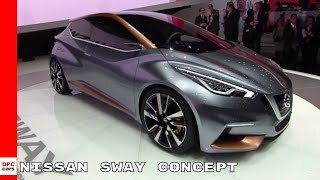 Nothing has been disclosed by Nissan officials in regards to the performance of Sway Concept 2015 but being a hatchback concept you can expect a day to day usage offering better fuel efficiency. This implies a mid range powerful engine concentrated upon, fuel efficiency, less CO2 emissions and acceptable power.